Why am I posting this? Well, the leather pen case on the right is an old 2-pen Pelikan case. At the moment it contains the 823 and L2000, though the 823 is a bit of a stretch. 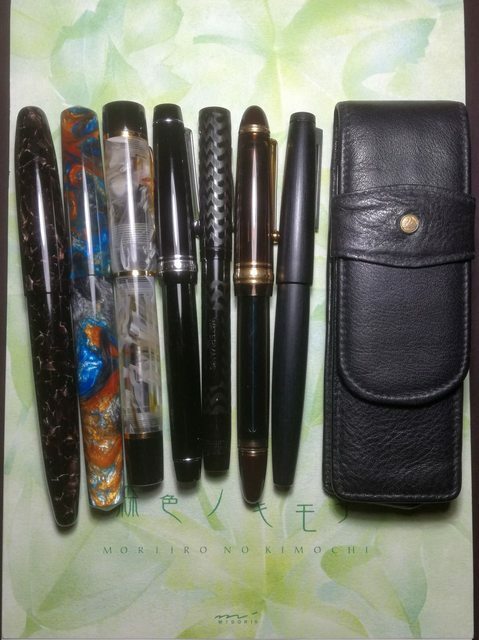 I would prefer to have a 3 pen case, and one that actually accommodates any of these pens more easily. BTW the Bexley is too fat for the case, but will likely get flogged off soon, so I'm not bothered by carrying that one. Sadly I did have a single pen case from my63, but I cannot find it and fear I may have lost it somewhere. Anywho, recommendations would be appreciated. Last edited by Empty_of_Clouds; February 25th, 2019 at 03:15 AM. Try pen wraps. I have a Levenger 5 pen wrap that I use to carry my inked pens. Agreed, I use a wrap as well, fit's 6 pens comfortably. For an office-environment it's perfectly well suited, probably too less protection for university or school. I've thought about pen wraps but not sure of the level of protection they provide. My Levenger wrap is leather outside and cloth inside. I carry my wrap inside my Backpack. I mostly care that the pens don't scratch each other and don't get damaged inside the backpack. For this purpose, the wrap works fine. Once I'm in the office the wrap is usually open on my desk, and I put my pen(s) on top, when I'm not writing. I wouldn't carry the wrap by itself though (without a backpack...), I'd worry it would open or a pen could slip out. It really depends how and where you carry the pens. I have a three pen zippered leather case from Galen that is really wonderful. It provides better protection than a pen wrap. Okay, good to know. I use a Tom Bihn Maker's bag for work stuff. Whatever pen case I use will fit into one of the organisational slots in the bag. Beyond that the pens generally stay in my office. p.s. the 7-pen-roll in canvas or suit fabric is $35.-, in nappa leather it's just south of $50.-, i have used the grey suit version for over 2 years, and pretty much daily, and it looks like new. Sorry, I should have been clearer. The case isn't to carry all the pens, only 3 at a time. @carlos.q, I've looked at those online (and I have one of their notebook covers), but there are two things of concern here - one, that there are reports of the leather dye staining the pens, and two, as in your picture they take small pens okay but a couple of my pens will not fit. Nock Sinclair might work. I think the flap on a Nock Lookout might be a little too short to close over your largest pen. That's an interesting suggestion. How gentle is the nylon interior on the pens? I've had no qualms about it, even with nicer pens. It feels smooth and pliable. If you prefer plush linings, perhaps something from Rickshaw Bags? I know the conversation moved away from pen wraps but I wanted to add my 2¢. I bought the Levenger wrap a while back and quickly learned to really dislike it. It didn’t have a flap over the top of the wrap so pens could (and did) easily fall out the top. It looks like the recent version may have fixed this problem but if not the wrap is practically worthless. Which reminds me, EXBPens makes (used to make? haven't seen anything listed in a while), three-pen wraps. When I first started looking I was attracted to the Nagasawa 5 pen leather roll. Alas, it's $100, nice though it is. I will look into some of the suggestions here, so thanks for those. Glad your trip is shaping up for you. I can't help you with any pen caring options, though. I don't have anything like that. Pilot has some nice wraps. They have five slots, two of them wider than then rest. The ateliers Penelope "tool pouches" are exceptional. Really great canvas that becomes softer as you use it. Put some canvas wax on it and it becomes water resistant / proof. It will hold 3 pens separated or 4 pens and a Field Notes size notebook or a Moleskine 3x5. If you don't care about separating your pens I have had 14 pens in it including the zipper pocket. I have also used some felt draw string pen sleeves to protect pens that aren't separated including utilizing the notebook pocket and that works well also. They are a bit pricey, but will last a lifetime and patina with age. Last edited by Bisquitlips; March 3rd, 2019 at 03:14 PM. My recommendation as well. It very easily holds three pens, and if you don't put a small notebook into the notebook pocket it'll carry another three or four pens. My longest pen is a Nakaya Neo Standard and it fits just fine.